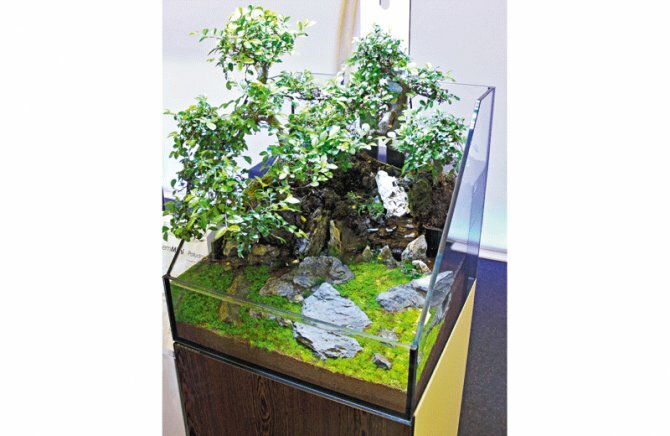 This sort of tank would be a special order, so we got a quote from specialist manufacturer Aquariums Ltd for a similar looking design tank and cabinet, with tank dimensions at 45 x 45 x 45cm/18 x18 x 18”. Expect to pay £299 for tank and cabinet or £349 for the clearer, Opti-White version. Lighting: Being open topped and with foliage protruding over it, a hanging pendant light is essential. Expect to pay £200 for a GroBeam 1000 LED from TMC. Filtration: This should be adequate for your needs but discreet. Fit an external filter and hide pipework behind the foliage and terrestrial section. Expect to pay £70 for a decent external filter for this size of tank. Heating: You don’t want the heater to be visible so fit an in-line one like Hydor’s ETH heater to the pipework of your external filter, or buy a Thermofilter that already contains a heater, from Eheim. Expect to pay £40 for the Hydor external heater. Soil: The substrate is aquatic soil. You will need approximately 20 litres to create an effect like this. Expect to pay £60 for the soil. Decor: Rock Mini landscape rock holds back the land section and aquascapes the underwater section. Expect to pay £40 for12 kilos. Aquatic plants: Fine carpeting plants like Hemianthus callitrichoides 'Cuba' (HC) and Utricularia graminifolia form the foreground. It would be difficult to add CO2 to water this shallow so go for a pressurised set and inline gas reactor connected to the external filter in the cabinet, or add liquid carbon on a daily basis. Expect to pay £30 for five pots of HC and £40 for five pots of Utricularia. Expect to pay £6 for a small bottle of EasyCarbo. Bonsai: The icing on the cake, the Bonsai trees, are an indoor type, so choose yours carefully. Expect to pay £85 for a decent sized indoor variety. This item was first published in the Christmas 2010 issue of Practical Fishkeeping magazine. It may not be reproduced without written permission.